Crime in Ecuador continues to occur at a dramatically high rate and is often violent. American citizens have been victims of crimes, including but not limited to homicides, armed assaults, kidnappings, robberies, sexual assaults, and home invasions. American citizens have also been victims of violent crime on beaches, both at popular tourist destinations and in remote areas. Robbery of taxi passengers is a serious problem in the Guayaquil and Manta areas. I saw this after I had booked our airline tickets for Guayaquil. I booked the travel to allow us to arrive into Guayaquil in the early/mid afternoon to give us a chance to find our hotel and get oriented before dark. The Lonely Planet guidebook I purchased for this trip referred to Guayaquil as having a possibly unearned reputation as a dangerous place for visitors. At any rate, I was a bit apprehensive about this part of the trip, particularly getting from the airport to the hotel. 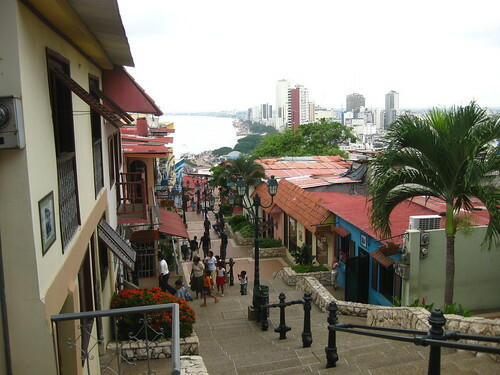 While Guayaquil revealed itself to be unremarkable at best (most of Guayaquil was destroyed in a major fire early in the 1900’s so it’s Spanish colonial beginnings have been mostly lost), we didn’t encounter any difficulty or situation approaching danger. Although, we did stick to the recommended “safe zones” for tourists. We stayed at the Hotel Presidente Internacional which was very nice but in a somewhat drab section of town. However, we were only 3 to 4 blocks to the main drag, Avenida 9 de Octubre. Along this street were lots of shopping, fast food, banks and other needs for daily life. 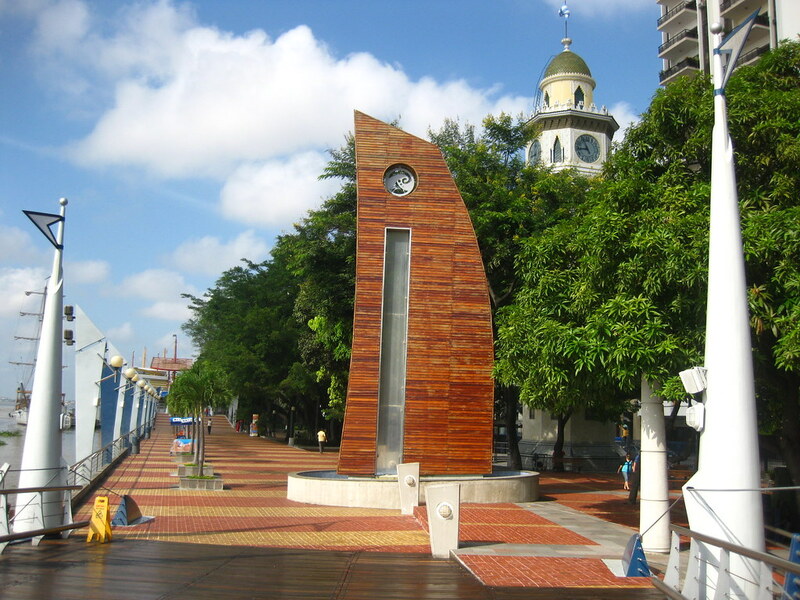 One end of the street begins at the Guayas River along which runs the Malecon 2000, arguably, the best feature of Guayaquil. The Malecon is a wide promenade or boardwalk that runs for perhaps 2 miles along the river. There are benches, trees, bridges, towers, food stalls and a very lovely garden space along the Malecon. According to Lonely Planet, this areas is completely safe and is well patrolled by police. Based on our experience, this is true. We spent several hours exploring the Malecon from one end to another on Sunday. There were lots of couples, families and other groups along with us. At the Northern end of the Malecon is Barrio Las Penas, a colorful hillside community of houses, restaurants, bars and shops. There are 444 steps from bottom to the top at which point you’ll encounter a small lighthouse, a chapel and a nice view of Guayaquil. On Monday, we took a taxi to the Terminal Terreste (the bus terminal) and purchased a ticket to Salinas ($3.50 each way). First, the bus station is very large with many shops and eateries in one hall and a vast selection of bus companies in the other hall. For each section of the country and for international bus travel, there are various bus companies to choose from. We had been give the name of a bus company to use by the very helpful front desk staff at the hotel. They told us that this particular bus would be (mostly) non-stop to Salinas. This type of bus service is sometimes referred to as “Executivo”. After purchasing our ticket, we were directed to go immediately to the departure area for boarding. The bus was nice with comfortable seating and mostly empty. They played a US action movie, “The Marine”, dubbed in Spanish with the volume at the high end of the scale. The trip to Salinas was about 2 1/2 hours. At various points in the trip, there would be a brief stop and someone would hop on the bus with some type of snacks, fruit, ice cream, water and other beverages. Food service at your seat. Did I mention that Ecuador is either the #1 or #2 exporter of bananas in the world? Suffice to say that along the highway you can see miles of banana trees and large piles of bananas at every roadside stand. They also grow most other fruits we’re familiar with and some we didn’t recognize. 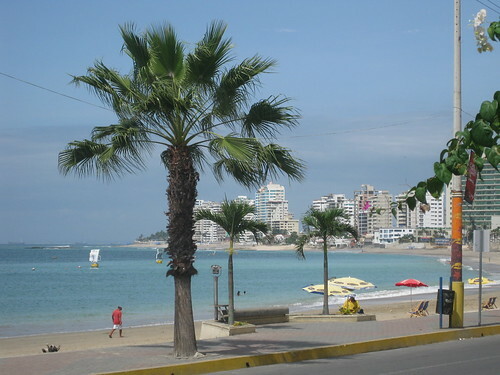 Salinas is the primary beach destination for residents of Guayaquil and the rest of southern Ecuador. There’s also a marina there that apparently is a prime stopping point for yachts traveling the Pacific coast. It’s a nice beach and a pleasant break from the heat of Guayquil, but a block in from the water it’s a poor, dusty little town. Seems like motorcycles are sold in appliance stores? On Avenida 9 de Octubre, a car experienced a flat tire. While the car remained in the traffic lane and passengers remained in the vehicle, several men set about to change the tire. No need to drag it away somewhere. Just take care of it right there and then move on.